* [[Frankl's union-closed conjecture|Polymath11]]: proving Frankl's union-closed conjecture. Proposed Jan 21, 2016; launched Jan 29, 2016. Concluded, Jan 17, 2017. * [[Rota's conjecture|Polymath12]]: proving Rota's conjecture. Proposed Feb 28, 2017. * [[Intransitive dice|Polymath13]]: Intransitive dice. Proposed Apr 28, 2017. * [[linear norm|Polymath14]]: Classifying homogeneous norms on groups. Initiated Dec 16, 2017; solved Dec 21, 2017. Research results have now been published. * [[De_Bruijn-Newman constant|Polymath15]]: Upper bounding the de Bruin-Newman constant. Proposed, Jan 24 2018; launched Jan 27 2018. * [[Hadwiger-Nelson problem|Polymath16]]: Simplifying the lower bound proof for the Hadwiger-Nelson problem. Proposed, Apr 10, 2018; launched, Apr 14, 2018. * [http://gowers.wordpress.com/2009/09/16/possible-future-polymath-projects/ Possible future polymath projects]. Discussion opened September 16, 2009. 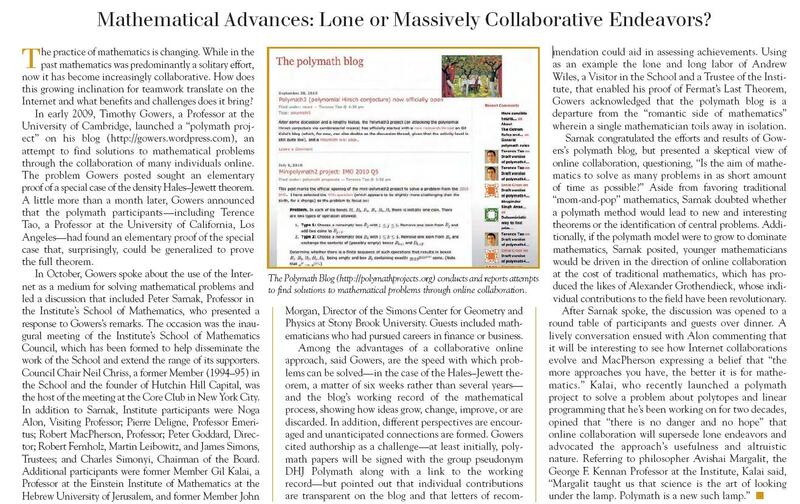 * [http://rjlipton.wordpress.com/2011/05/12/a-possible-polymath-project/ A possible polymath project:] Proposal by Richard Lipton to attack a conjecture due to Erdos, about a class of Diophantine equations. A (partial) list of proposed projects can be found [http://polymathprojects.org/category/polymath-proposals/ here]. This page has been accessed 1,813,807 times.